The Mayor of London, Boris Johnson, has written to the Home Secretary asking her to licence water cannon for use of the UK mainland for the first time. Before Theresa May makes her decision and gives the final green light here are just 10 of the reasons why water cannon are a bad idea.  tertiary - injuries caused by impact of the body with other objects. Five of the six largest police forces do not want water cannon. West Midlands, Greater Manchester, West Yorkshire, Merseyside and Thames Valley all rejected the idea and said they are not willing to pay for them. In fact the Police and Crime Commissioner for the West Midlands, the second largest police constabulary in the country said “Such equipment would be as much use as a chocolate teapot”. The Mayor wrote to the Home Secretary saying there was “broad public backing” for the use of water cannon. But, a closer look at the consultation responses would show 59 respondents in favour compared to a whopping 2547 who opposed the plans. The Change.org petition against water cannon currently has over 44,000 signatures and the one public consultation meeting attended by around 200 people was strongly opposed to the police having water cannon. 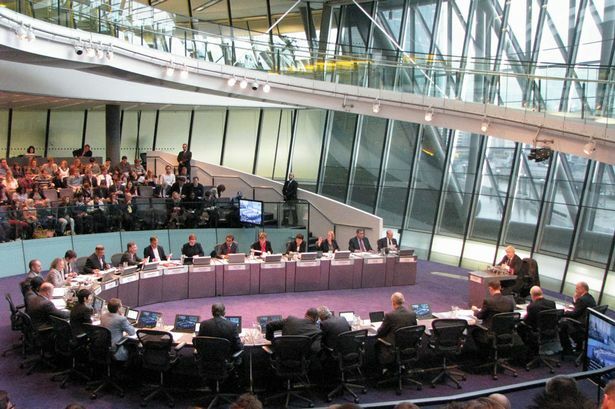 The London Assembly voted 20:5 to oppose the Mayor spending money on water cannon. Among the 20 opposed to the plans were members of the Mayor’s team including the Deputy Mayor of London, the head of the fire service and the former Deputy Mayor for Policing and Crime. If the Mayor cannot convince his own team then we can only hope the Home Secretary says no too! The Mayor’s website says he has agreed to get water cannon to help the police response to riots and serious public disorder. 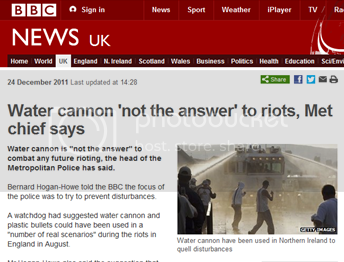 But water cannon doesn’t stop a riot. In fact after the riots Sir Bernard Hogan-Howe, Commissioner of the Metropolitan Police said just as much. Apart from being no use in a riot, the police briefing in support of water cannon goes on to say there isn’t even any intelligence to suggest an increased likelihood of serious disorder. Instead the purpose of these weapons is for future protests against austerity. People have legal right to protest and should be free to do so without the fear that water cannon could be used against them. The police briefing accepts “The mere presence of water cannon can have a deterrent effect…” This will particularly be the case for some people who because of age or physical disability are more vulnerable. The Mayor has decided to splash out £218,205 of public money on three second-hand German water cannon and fixing them up to meet London’s roads. Add ongoing training for officers, storage in central London and maintenance and the cost will increase further. When police budgets are being cut is this really what they should be spending our money on?